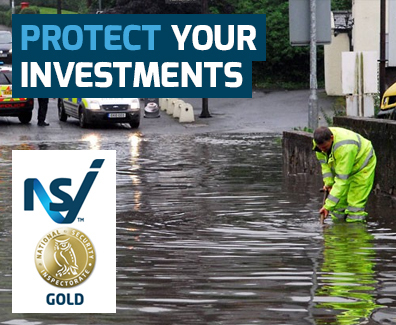 FLOOD-ALARM Water Leak Detection Units represent the latest technical developments in security against ingress of water into areas housing high technology or high value equipment. Two sizes of FLOOD-ALARM units are available as standard: FLOOD-ALARM 10 is complete with 10m of Water Detection Cable, and FLOOD-ALARM 20 is provided with 20m length of Detection Cable, and both have an Output Signalling Relay. Units with a Leader Cable or longer Detection Cable lengths, or other options, are available to order. The Cable can be laid on the floor slab loose, fixed down with self adhesive plastic cable clips, or with the clips reinforced with contact adhesive. For pipework applications the Sensor Cable is tie-wrapped or taped to the base of the pipe. For monitoring open areas with no floor voids the cable is clipped to the skirting board at floor level. The WATER-GUARD is used in conjunction with single or multiple spot probe or spot pad sensing and specialised applications including Level, Cistern, Tank, Overflow, Sprinkler, Gutter, or Rain detection systems. OUTPUT SIGNALLING: The system can be provided with a set of no-volt relay contacts which activate on water being detected and are suitable for a remote Repeater Panel, or linking into a computer based BMS system, switch sump pumps/drainage systems, Autodial Unit etc. All our alarm systems are tailored to meet the needs of individual clients and their properties, for more information call us today to arrange your free survey 01638 778630.